Make your own embroidered felt star baby for a holiday ornament, a sweet little toy, and/or embroider a name and date for baby's first Christmas! The finished ornament is 5 inches/ 12cm tall and wide. 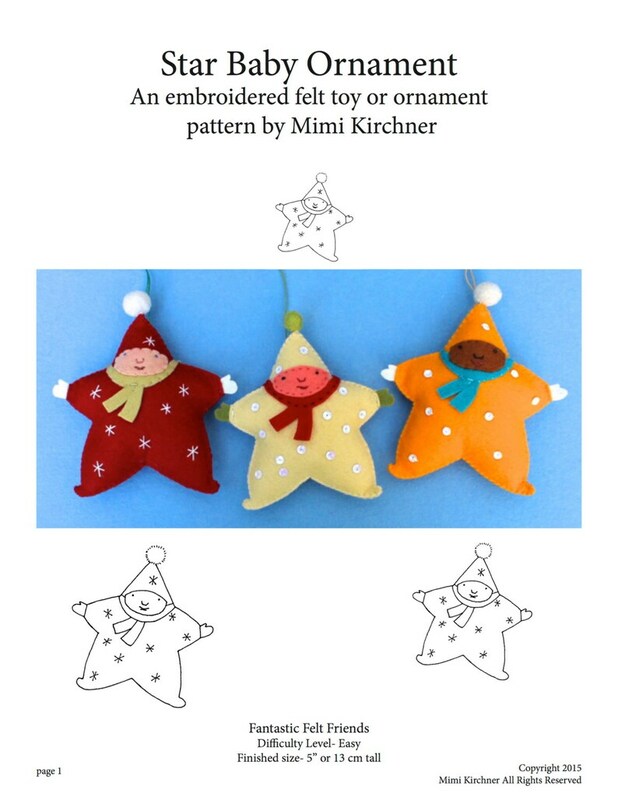 This PDF pattern is 5 pages which includes written instructions and illustrations for a star baby, full size pattern pieces, and sources for materials. This sewing project is rated easy. Skills needed- Threading a needle, tying a knot, very basic embroidery stitches. It does require an interest in tiny detail work. Supplies needed for this project include- felt- 5" x 5" plus small amount of other colors. Small amount of stuffing, embroidery floss to match your fabric. Basic sewing supplies like needle, pins and scissors. Very cute baby stars!! :-) Printed out great--can't wait to make them!